Midnight Snack is a common Neutral creature card. It is part of the Heroes of Skyrim expansion. 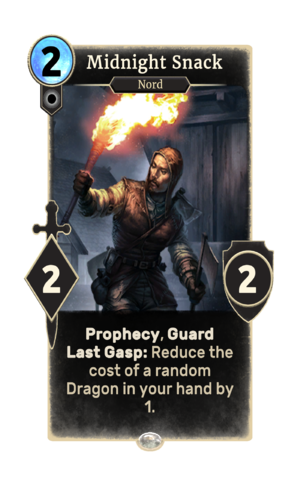 In addition to the card's availability in the Heroes of Skyrim expansion, three copies are included in the Alduin's Apocalypse theme deck. This card's last gasp ability applies the Full Belly card effect. This page was last modified on 27 February 2019, at 19:18.